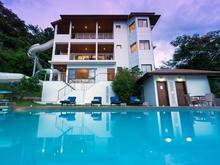 View and book from over 5 villas from 316 USD per night. Book with peace of mind with our Price Guarantee and local customer support. Villa Lulu is set in a 3056 square meters of landscaped property in a tropical forest just south of the northwestern tip of Koh Samui. Situated on a hillside amongst lush tropical gardens, this villa is a stylish combination of traditional Thai design and modern elegance.